With plenty of eye candy and over 25 flat screen TVs, this bar also has an outdoor patio. Bar1 Patio Bar is the Best Gay Bar in Phoenix!!!! Bar1 is by far the best gay bar in Phoenix. The bartenders are amazing! The atmosphere and the vibe is fun and hip with the best selection of alcohol in Phoenix. Their is an upscale lounge area, pool tables and games, and the valleys best patio. This is definitely the place to be when your in Phoenix. The bartenders are friendly and make great drinks! Bar1 has the best karaoke every Tuesday night. Thursday's are 2-4-1 all day and the place gets busy, lots of hot guys all day long. 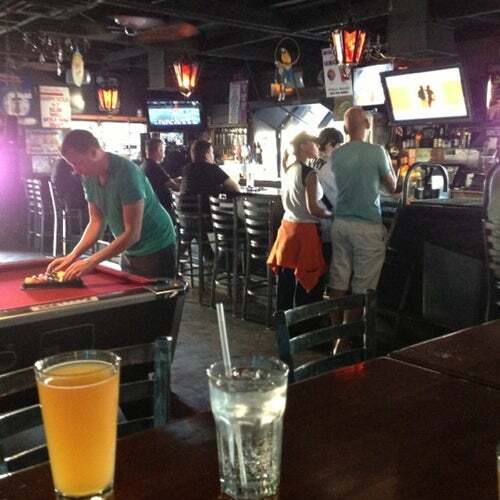 This is the best bar in Phoenix for Day or Night Drinking, it's always a great time at Bar1 on 16th Street in Phoenix. I love Shelby what a great personality, always makes me laugh... The people have always been really nice, and prices are just right ! We're visiting Phoenix for six weeks. Our friends took us to Bar 1 on a Thursday night around 10 pm. It was packed. Not sure if there was an event, but the atmosphere was lively. Friendly and attentive bartenders. Looking forward to returning. Love the pool tables, candle lighting and bar set up... etc. Good job! If you wax any part of your body, this isn't the bar for you. If you can hang out, play pool, drink beer (Fat Tire on tap! ), and flirt, this is a good place to be. One of the Owners is a Cutie! The crowd is around mid 30s. This place has wonderful drinks and a laid back atmosphere. It is fun place to sit and talk with friends, as to the staff, they have been really really nice and sometimes really really not. I feel the space is inviting and warm. Most def, will be back but will not have high expectations with bartenders. They do seem to be confused with the concept of neighborhood bar and the friendliness factor of the bar scene. The bottom line is I go there to have some strong drinks laugh with my friends and that is always a success at Bar 1. Not sure what they are going for here. Been twice and wondered why I went the second time. The patio area is very unexpected. Not massive like Charlie's, but excellent for a neighborhood bar. I enjoy coming here to get the evening started. My experience here has always found decent service and a laid back feel. I'm a BIG fan of Bar 1's patio. I hang out there more than I do inside. However inside is can bee cozy and intimate too. Grumpy old bartender in there sometimes tho. All in all, nice ambiance. Nice patio area and good music mix from the Bartender/DJ. It was kinda quiet because I think everyone had gone to Charlie&#039;s. Worth a look. The place has way too many candles going, we were expecting vampires at any turn! The patio is over crowded with questionable furniture. The drinks were good but, the staff weren't especially friendly don't expect we'll go back anytime soon!